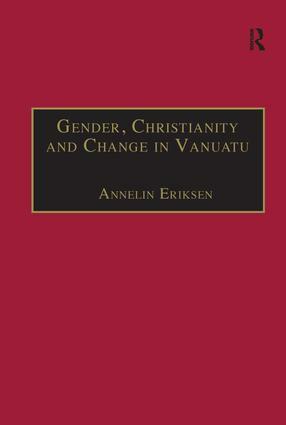 Focusing on cultural change and the socio-political movements in the Pacific island nation of Vanuatu, this book uses both anthropological and historical analysis to examine the way the relationship between gender and Christianity has shaped processes of social change. Based on extensive research conducted over several decades, it is one of the few books available to focus on Vanuatu and on the impact of Christianity in Melanesia more generally - as well as on the significance of gender relations in understanding these developments. Providing a model for understanding and comparing processes of change in small-scale societies, this fascinating book will appeal to scholars and students interested in the ethnography of Melanesia and in issues related to contemporary cultural change and gender more generally. Annelin Eriksen is Post Doctoral Fellow at the University of Bergen, Norway.